Private access for you and your family on the South Grand River wetlands flyway near Truman Lake. Total acreage, 200 3 separate properties. Total wetlands floodable acres, 35 (Floodable timber, 170+, Flooded crop fields and open water acreage, 80) Crop goose stubble, 220. Back watershed from the Truman Lake Reservoir on the South Grand River. This is a historic Mallard Flyway and former market hunting area. In this area you can choose from public hunting the deep water of Truman lake, stand in line or draw for a blind at Montrose Conservation Area or hunt from the blind of your choice when you want to hunt with Mid-America Hunting Association. 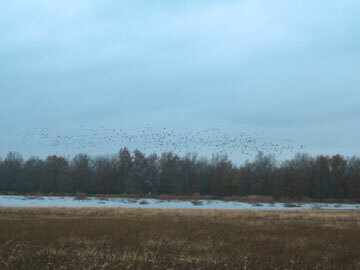 A flock of early season Widgeon feeding on flooded smartweed as we were preparing the blinds for the season. The shooting pool and surrounding water surface looking out from blind 2. Chest waders are required to access the blind. Under normal conditions, it’s an easy walk from the parking area. If the roads are muddy, be prepared to walk 3/4 of a mile. ATV’s are allowed to haul decoys to and from the blinds, but they must be parked at the parking area, not near the blind. Remember we are real duck hunters and do not go for sloppy methods. Blind 2 faces the Grand River to the south. The shooting pool covers a 10 acre area and is 2 to 3 feet deep. 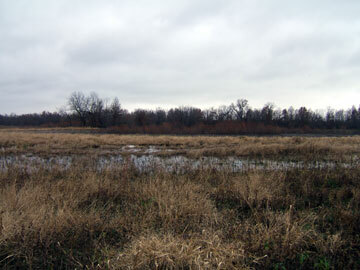 This wetland was developed by the Association in 1982. 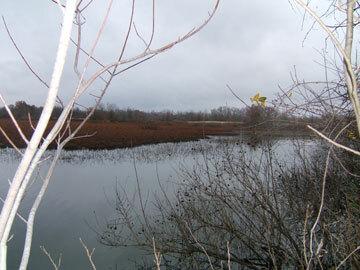 Levees and pipes have been added over the years to improve both the habitat and the hunting. Blind 2 is only a 50 minute drive from Kansas City. Private land in this area is high demand and almost impossible to acquire. The Grand River is a major tributary to Truman Lake, which has open water for late season hunting when many other Missouri waterfowl areas are frozen and not huntable. 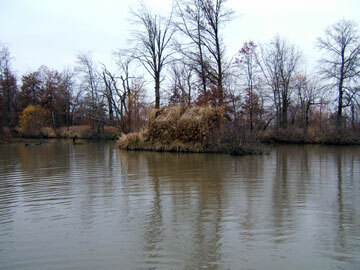 Duck Blind 3 is accessible by dry land and surrounded by timber on an old oxbow from the Grand River. It is a considerable walk from the parking area if the road leading to the blind is muddy, but easily accessible by ATV. The water depth is 24 to 36 inches, so chest waders are required to retrieve game. If a hunter is looking for an early season wood duck drake to mount this is the blind. Due to frequent log jams on the Grand River, this area floods often on wet years. 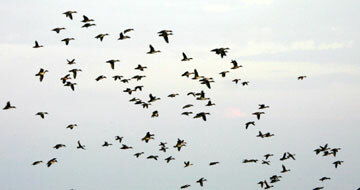 Mallards and a variety of other ducks are attracted to the slough to feed on acorns and flooded vegetation. Blind 2 has provided quality duck hunting to our hunters for 22 years. A view from the blind facing northeast. 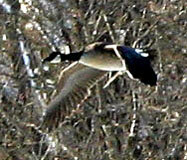 Wade-in, meaning no permanent blinds, area largely for duck hunts. 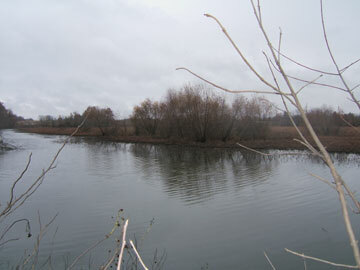 The marsh is 11 acres of open water with natural vegetation of smartweed and millet for the ducks and geese to feed on. 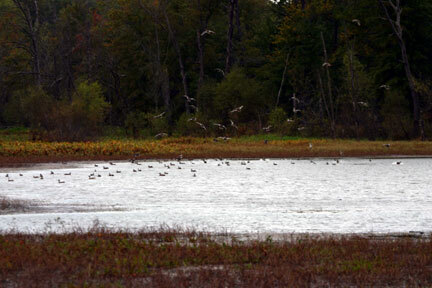 Early teal are attracted to this area as well as late season mallards and Canada Geese. 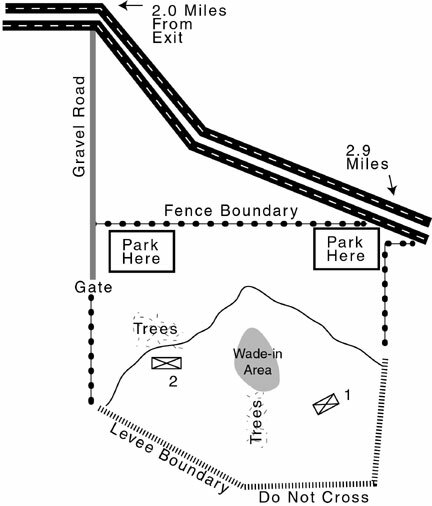 If the dirt road leading to the marsh is muddy the wade-in area is a 1/2 mile walk from the first parking area. 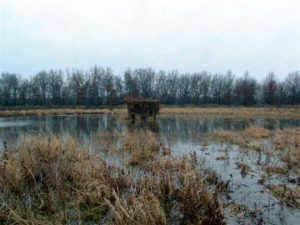 Chest waders are required to retrieve game and to place decoy spreads. Most hunters are not willing to hunt on their own and prefer hunting from comfortable blinds out of the water leaving areas such as this underutilized. Layout boats and portable blinds are allowed on Association wade-in areas. ATV’s are permitted to haul gear and decoys to and from the blinds and wade-in areas, but must use the same roads, dirt paths and parking areas as vehicles. The question occasionally comes up, do we allow boats with motors on our lakes and ponds without blinds? We do not allow boats larger than small johnboats that can be hauled to the lakes and wade-in areas by person or ATV because these are all working farms and access to our marshes, lakes and wade-in areas is usually difficult and not allowed by vehicle. Our South Grand River Missouri wetlands are a sizable endeavor meaning plenty of places to hunt and a consequence as the ducks typically pick one more spots over others of where they want to be changing day by day through the season. 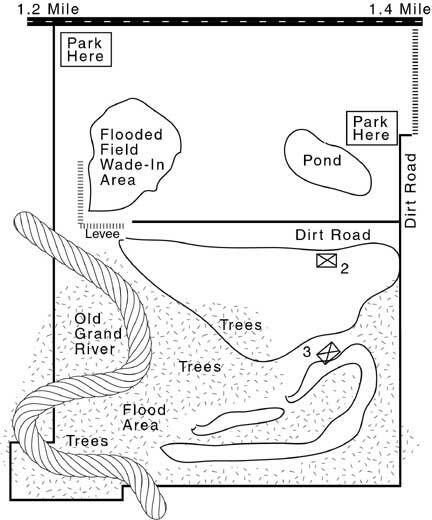 This diagram is one more section of our wetlands. Before picture after camouflaging the blind and before flooding. Typically, the lake is drained in mid June to allow smart weed and wild millet time to grow. We mow a circle in front and behind the blind for a shooting pool and close the gates the end of August. The water source is a combination of run off and overflow from the Grand River. 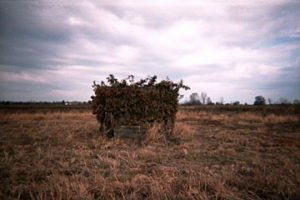 Crop is planted to the edge of the marsh. After the crop is harvested a 12 inch extension is placed on the overflow pipe to flood the crop stubble. Access is difficult and chest waders are required. 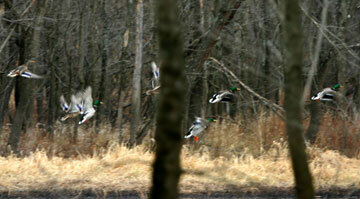 Members have enjoyed quality waterfowl hunting from this blind for over 15 years. The lake is 1/2 mile long and covers close to 50 surface water acres. Late season goose hunting can be very productive for those that are tough enough to break ice and carry their gear and decoys from the parking area to the blind. The shooting pool covers a 10 acre area and is 2 to 3 feet deep. 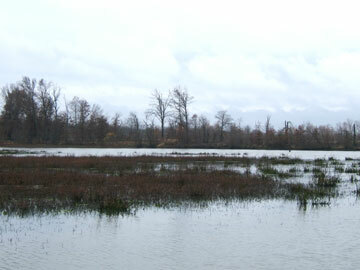 This wetland was developed by the Association in 1982. 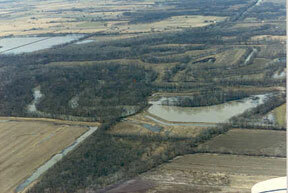 Levees and pipes have been added over the years to improve both the habitat and the hunting. Blind 2 is only a 50 minute drive from Kansas City. Private land in this area is high demand and almost impossible to acquire. The Grand River is a major tributary to Truman Lake, which has open water for late season hunting when many other Missouri waterfowl areas are frozen and not huntable. 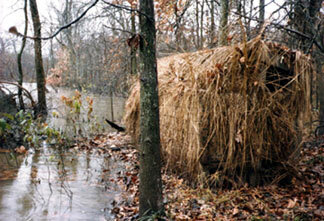 Another view of a South Grand River Missouri wetlands duck blind. Volunteer Association duck hunter labor to camouflage the blinds at right. A secluded out of the way blind with easy access from the parking area. Hip boots can be used but we recommend chest waders. The blind faces the South Grand River and is less that a 1 hour drive from KC. 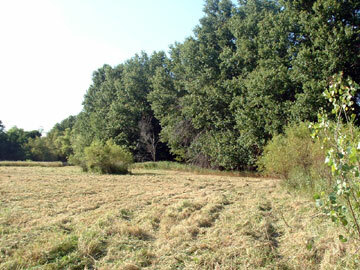 A before flooding picture of the same blind location that was previously used as a wade-in area. We chose this location to place the blind after watching the pattern of the birds over the years. The ducks funneled into this area of the lake, especially on windy days. After putting two and two together we realized they were using this location to feed on smartweed and especially acorns from the oak trees when the water was high. Other views of the South Grand River Missouri wetlands wade-in area.